Plant crops of varying types on your field, as they become available. Merge similar crops, and they will grow or upgrade, providing a larger harvest. The bigger your plants, the more fruit and vegetables they will produce. Farming is endless, which means you’ll need to manage your farm daily. 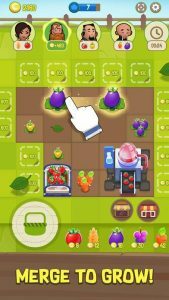 Choose where to plant crops, place animals, and more. Decorate by placing garden gnomes, tractors and more around the farm. As all good farmers know, it takes time for crops to produce delicious fruit. You can harvest crops whenever, but keep an eye out for the orders from your traveling merchant at the top of the screen. Fill those orders to make money, buy more crops and grow your farm.